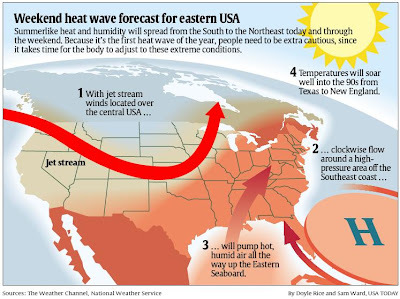 The Weather Guy: Heat Wave! This graphic from "The Weather Guys" over at USA Today. Yep, it's heating up! But for those of us down on the Gulf Coast it's actually a good thing. The higher daytime temps (97 yesterday at TPA) help spark the afternoon storms bringing much-needed rain. The downside is lightning, hail, funnel clouds and flooding. But we'll take the bad with the good when most of our yards look like the Sahara.